Atletico Madrid forward Antoine Griezmann has returned to preseason training with the La Liga club ahead of the 2017-18 campaign, with his long Manchester United transfer saga now behind him. 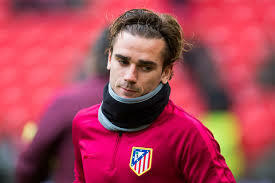 Griezmann had looked set to leave Atletico this summer and join United in a €100 million deal, giving conflicting versions of his intentions in a string of media interviews around the end of last season, before finally agreeing a new contract to stay with the Rojiblanco outfit after the confirmation of a FIFA ban which means the club could not sign a replacement this summer. The France international, 26, joined up his teammates on Wednesday along with teammate and Spain international Koke, as the squad were put through their paces by fitness coach Oscar “El Profe” Ortega at a training base at Los Angeles de San Rafael in the mountains to the north of Madrid. Diego Simeone’s side have this week been undergoing triple sessions designed by Ortega as they look to start the new campaign in top form, with fit-again midfielder Augusto Fernandez and re-signed centre-forward Fernando Torres among those to the fore in the early exercises. Atletico’s preseason schedule includes a trip to Mexico to face Deportivo Toluca on July 26, an Audi Cup game against Napoli in Munich on Aug. 1 and a visit to Brighton and Hove Albion’s Falmer Stadium on Aug. 6.